Today’s post for United Inkdom is a review of the Nettuno 1911 Tritone, on loan from iZods for review purposes. As someone who prefers slim, elegant lines over pretty resins, I really didn’t think I was going to like this pen, with its flat ends and fairly wide body. The Tritone is a very pretty resin though – pearly highlights gleam out from within the blue grey – you want to pick it up just to look at it and touch it. It has a nice weight in the hand too. I must admit that I found its looks very appealing. It appears to be a limited edition, since this one has the number 0001 inscribed on the barrel end. I’m not overly keen on the upside-down “Nettuno” inscription on the barrel, especially as it’s right across the most pearlescent area and rather spoils the “view”. In truth, I’ve never gone in for the whole label-on-the-outside thing either, but as there is a tradition of such inscriptions on fountain pens, I’ll let that aspect slide. So, aesthetics aside, how does it write? I dip tested it initially and then partially filled it with Pelikan 4001 Turquoise for a second test. It has a good-sized converter included, so you won’t run out of ink in a hurry if you fill it up fully. The engraved nib is fairly smooth on the page and quite enjoyable to use. It is a little springier than you might expect for steel too, although there is no real variance in line width, so it isn’t a flex nib. This particular pen came with a (Western) Medium nib, which is thicker than I am accustomed to using. Unfortunately, I noticed that it had a tendency to start skipping after about half a page, both with the initial dip test and the subsequent filled pen test (hence the second test). Of course, there may have been many reasons for this – bubbles in the ink/feed, an inability to keep up with my rapid scribble, an unhappy ink-pen combo or something else entirely, so I won’t hold that against it too much. That aside, the best I can say is that it was good enough, but didn’t really blow me away. 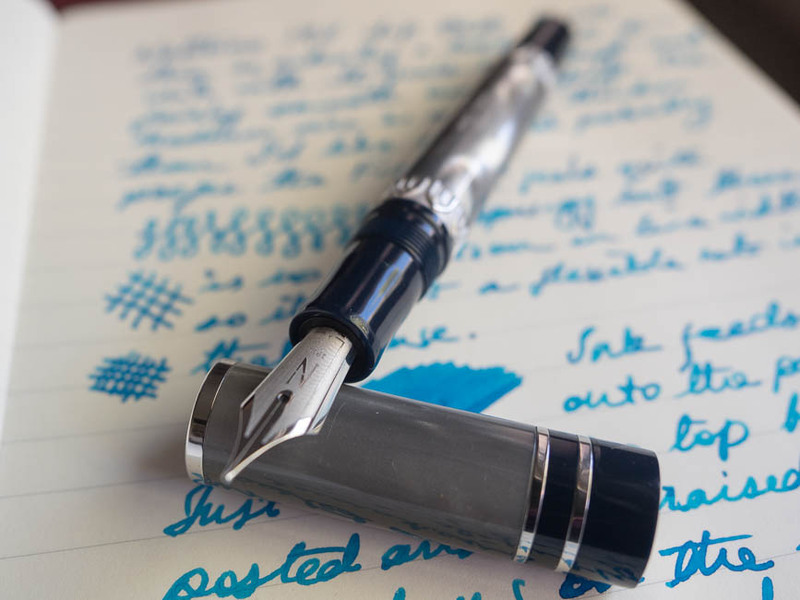 You can post the cap, but that makes the pen top heavy, whereas un-posted it is a comfortable weight, unless you favour very lightweight pens, in which case you’d best avoid this one. Whilst the metal bands with raised decoration are attractive, they are awkwardly located and may become uncomfortable with prolonged use. After a fairly short period of writing, I noticed their presence, so if I’d been using the pen for any substantial length of time, it would have become an irritation. It’s far from being an expensive pen (in the pen world), but it is certainly far from cheap, retailing at £219.99 from iZods. I can only assume that you are paying for the pretty, as I really would expect a gold nib for that price. In summary, it’s a stylish pen, as you might expect with Italian design, and if you are prepared to pay for that, then you will own a very attractive objet, which also writes adequately. However, body aside, that is a fair old wedge to part with for a steel-nib, even a shiny, pretty, engraved one with spring*. *For reference, I believe it is a Bock nib. If you use your pens primarily as tools, then there are much better offerings out there in this price range. If you covet pretty things, then this could be one for your collection, but don’t expect to use it as an every day workhorse.